Ana Cristina Freitas Brasão Amador holds a Ph.D. in Economics from Universidade Nova de Lisboa. 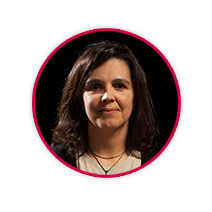 She is currently Professor at the Lusófona University, where she is the director of the School of Economics and Organizations. She is the Director of R-LEGO Journal. His research interests are sustainability, microeconomics, the circular economy and the economy of the environment and natural resources, more specifically the economy of the sea and fisheries. Brasão, Ana; Bjorndal, Trond; Tusvik, Amalie; Ramos, Jorge. (2016) Fish processing in Portugal: An industry in expansion, Marine Policy, 72: 94-106. Brasão, Ana; Palma, Catarina R. (2010) Strategic Games in Groundwater Management. In Investigação e Prática em Economia, ed. Eduardo de Sousa Ferreira, José Paulo Oliveira e Maria João Mortágua (p.125 – 137). Cascais: Principia. Brasão, Ana; Bjorndal, Trond (2006) The East Atlantic Bluefin Tuna Fisheries: Stock Collapse or Recovery, Marine Resource Economics 2, 21: 193-210. Brasão, Ana; Duarte, Clara C; Sá, Maria A. C. (2001) Managing the Northern Atlantic Bluefin Tuna Fisheries: The Stability of the UN Fish Stock Agreement Solution, Marine Resource Economics 1, 15: 341-360. Brasão, Ana; Pintassilgo, Pedro; Duarte, Clara C. (2000) Regional Management of the Northern Atlantic Bluefin Tuna: An Application of C-Games, Marine Resource Economics 15, 1: 21 – 33.